Do Different Content Types Help in Building Quality Links? Content has always been a great tool to attract visitor traffic and social media engagement. 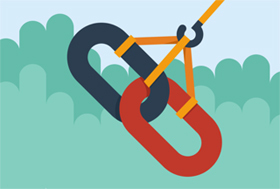 However, lately content has become a magnetic tool for webmasters to attract quality links. Most of our clients contact us for launching their SEO campaign are curious of knowing how we would manage to get links for their website. And we answer them- via beautiful, amazing and share worthy content. Content has always been a great tool to attract visitor traffic and social media engagement. However, lately content has become a magnetic tool for webmasters to attract quality links, be it from blogs, top-tier news publications, or anything in between. What’s interesting to know is that we can create different kinds of content for different link targets in the way we create different kinds of content for different channels. The article covers many different types of content we create for our clients which can attract links, quality links. Read between the lines to get a glimpse of the types of content that we create and distribute to get links. When your content conveys an idea that’s further validated by references and statistics, it happens to be the biggest reason for linking on the web. Therefore, if you create pages that are backed by data and stats, you’ll have a great chance of being referenced and linked in the niche topics. To add references and stats, you needn’t to delve into in-depth studies, you can rather simply aggregate the information that’s already out there. Amused, how events could fetch authority links? If the event is one that people waited for long, they would surely link your page so they can sign up or get tickets. Speakers who you invited for the event would also love to share it and will likely link back to it from their personal or commercial site(s). Alternatively, you can also add your event to multiple event listing sites with link back to your website. Though, some of these links will be no-follow tagged, there exist some event listing sites where you can add your event with a do-follow link back. Moreover, don’t miss an opportunity to get your event listed in the sites that list best conferences and events in an industry. Conducting thorough research on topics of importance is a time consuming process. Yet, if your research, manages to address pain points of industry or finds an angle that’s new to the industry, your study will always get a place in other sites with a link back. Once email automation firm MailChimp conducted a study to find an ideal length of an email subject line. That post attracted links from 68 domains with some of the most powerful sites on the web. Infographic could be a groundbreaking way to obtain authority links. Simply gathering a few of images, text and numeric digits won’t be enough to get you links and coverage. You have to make sure that you illustrate a piece of information using infographic that eventually proves a point and becomes a reference for the people to support the article they’re writing. Don’t go vague, rather, think of a story and then create something beautiful to highlight that angle. If you are in business to create illustrations, you’re almost having a great tool to open up your outreach and obtain authority backlinks. Create varied and amazing illustrations and then approach the websites that always look for beautiful design. Illustrations could be anything. From retro posters to faux book covers. The only thing you should ensure is an interesting concept and a beautiful depiction of that idea. It eventually helps you in having a great chance of gaining extended coverage and backlinks. Like hosting events, you can create tools to attract links. But, the important point to be noted is that the tool must address the pain points of the users. Tools that people like to use, attracts a wealth of links as people love referencing and recommending them if they find any value out of it. For instance, SEMRUSH offers some of the best SEO tools used by millions of the webmasters and digital marketers worldwide. Not only these tools get referenced on the websites that use them, but also get included in the blog posts that play around top tool Listicles. In this way, you can garner lots of linking opportunities if you want to be proactive about promoting your tool.